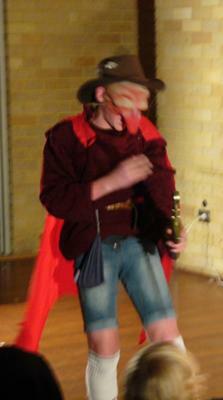 My brother, Ben has been working on Commedia Dell'Arte with his homeschool drama group. Last Saturday night we went to see the different plays. Ben was Il Capitano in the play and he said that he had been fighting thousands of men and killed them all on his own, but had received a cut on his arm. The doctor he went to was a fake doctor who took all his money. When Il Capitano took the medicine, it did not help, but only made it worse. Then,he was about to leave and say, "You are a fake doctor", but the doctor wanted to give him some different medicine. Meanwhile, the two servants were planning to steal the money from the fake doctor, but they did not know which bag to take. At the end of the play, they took the wrong bag and when they opened it, they only found a piece of bread in it. One of the actors was really dumb. He saw that the blue bag had bread in it, but still took it because he did exactly what the other servant had told him to do.